While Japan’s coalition partners argue over the agenda, Abe announces a new Cabinet position to push the issue in the Diet. Japan’s ruling coalition partners are continuing negotiations this week over the right to collective self-defense. The ruling LDP is trying to convince its junior partner, New Komeito, to agree to an expansive reinterpretation of Article 9 of the Constitution. So far the LDP’s attempts have met with little success. The two sides appear to be in agreement over addressing the issue of grey zone incidents first, as even New Komeito has conceded that this is an issue that Japan’s Self-Defense Forces need to be able to act decisively on, especially in light of heightened tension over the Senkaku/Diaoyu Islands. However, the coalition partners have not agreed on how to approach the overall issue. According to the Japan Times article, the LDP would like one agreement to cover grey zone incidents, an upgrade to Japan’s peacekeeping role, and collective self-defense, in order to be ready for Cabinet approval by this summer. 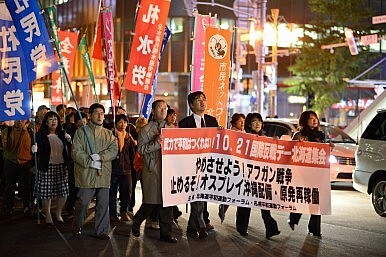 New Komeito wants to reach a separate agreement on each issue, followed by legislation to fix the corresponding laws. New Komeito’s strategy is likely a ploy to buy time, as reaching separate agreements on each issue would be unlikely before the special Diet session in the fall. Resolving the grey zone incidents issue, while leaving the others for a later date, is less likely to anger their more pacifist constituency. If the collective self-defense issue is unresolved after the fall Diet session, New Komeito may see itself being in a better position before unified local elections in the spring of 2015. While news of New Komeito’s stalling tactics came out on Tuesday, Prime Minister Shinzo Abe’s government announced yesterday plans to create a new post in the Cabinet, to be in charge of reworking Japan’s legal framework to allow for collective self-defense, according to Kyodo News. The new minister will likely be appointed in late August, when Abe reshuffles his cabinet. For now, Chief Cabinet Secretary Yoshihide Suga is responsible for explaining the government’s position on the issue, until after the Cabinet approves changes to the interpretation of collective self-defense. Abe’s announcement of a new ministerial position shows he is confident the Cabinet will reach a unified position by this summer. It could also be a means of applying pressure, to show New Komeito that its much larger coalition partner is making all the necessary preparations to press this issue before the fall Diet session.